Professional advice and resources for nuisance stray cat problems. Please Don't Feed Stray Cats! Need feral cat removal in your hometown? 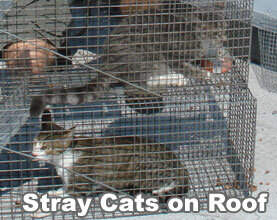 Click here for our nationwide list of stray cat trappers. I live in the country and I have been feeding several abandoned cats (6). There are also have (5) young cats 6-7 months old from these cats. This is the only home they have known. They took refuge in an unfinished part of my home during the winter. Shortly after Christmas my husband was diagnosed with a brain tumor and our lives are now changed forever. His hospitalizations have taken priority, and he now requires constant supervision and care. I am also desperately trying to hold on to my job. I continued to feed the cats because I have not been able to do anything else, and I thought I was a good person. I have asked for help from rescues only to be told they are full. Spay/neuter/return is not an option. I cannot physically get these animals to these facilities with my personal life as it is, and there is no way to take care of them if they come back. They are destroying my home and I am going to have to shut them out of where they are living. They will not have shelter for the winter. If they continue to have kittens there will be 30 or 40 more cats by spring. I am desperate to find someone to help me. I cannot physically or financially continue like this. I have 7 spayed/neutered house cats of my own and cannot take on any more. What if a neighbor is feeding stray cats? Is feeding stray cats illegal? As far as I know, it's not illegal, but it sure is harmful. Maybe in some states or counties it is against the law. You'd have to call your local animal control services to find out, and they will probably have an answer. But if you can't get help from an authority, your best bet is to talk to the neighbor. I know that's hard to do, especially if the neighbor is a crazy cat person. But work on your social skills with hard-to-talk-to people, and you might be surprised at yourself. Your good deed for the day! If you can't talk to the bad neighbor, then you may want to do your own trap neuter release program on your property. Stray Cat Info: Stray cats are defined as cats that are lost or have become separated from a home or owner. When people refer to stray cats, they usually mean feral cats. Feral cats are simply non-domesticated cats living in the wild. They were born in the wild, and have never had a home. Their behavior is completely different from domesticated cats. They are truly wild animals! There are 60 million cats living in American households, and an estimated 100 million feral cats! Cats are very self-sufficient (as most people are aware) and excellent hunters, and thus able to live in the wild just fine. You can read another email about trap, neuter, release here. sir or whom ever, please i hope you can help me,i use to about a couple of years ago, would leave food out for stray cats,but got reported so i had to stop. but there are still stray cats around here that are annoying, they pee on the porch knock over plants and uch,i do not want these animals hurt in anyway,i do keep moth balls in my yard and porch,but about two montha ago as i opened my fromy door,there was a dead bird head there,i asked a email friend about it who like cayts,she says it is a way of a gift or something like that,then the other day i opened the dorr in the yart was a ugh pile of bird feasthers neatly jus there,my friend says another gift,is this possible?i wondered oif any way you have heard of any thing like this,as i do feed the birds, you proablyget a lot odf weird letters but i am serious, i am not supitisoius,but wondered of she is done by stray cats,as there are kids around here,that you for any information, truly bettye.as you can see i am in arizona. And it's not just cats. Don't feed the wildlife either.